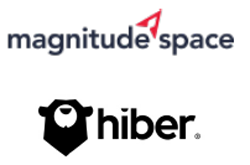 To reflect the importance of the launch of their Low Power Global Area Network (LPGAN) in 2018, international satellite and communication company, Magnitude Space, is re-branding as Hiber. The company's LPGAN, which will launch in early 2018, will revolutionize access, making the firm a global internet service company rather than only space-focused. This is a significant evolution for the Dutch corporation and the new name encapsulates this change. Becoming an internet-first service company reflects Hiber’s global ambitions and culture. Hiber’s mission is that making technology accessible to all can improve the lives of everyone on the globe, not just the first-world. Helping tackle climate change, grow crops more efficiently, manage natural resources better and even protect wild animals are their goals. Hiber’s LPGAN service delivers affordable access to their global satellite network and means data can now be easily and inexpensively transferred via the internet from the most remote of locations. CEO, Ernst Peter Hovinga said that by launching the first truly global, affordable low power network, Hiber has the potential to make a real impact to the lives of everyone across our planet, and that enabling people everywhere with ways to deploy existing applications into new territories as well as to develop new and innovative ideas. This will have an enormous positive effect on the lives and livelihoods of people globally. He continued that their DNA is friendly and approachable, with services that are easy to use and very accessible. Everything about the new Hiber brand from the name, to the logo, color and how they speak reflects this. Hiber is a brand that makes ‘doing business’ easy and they believe people will really engage with this. To that end, Hiber is no longer a ‘space’ company. They are an ‘Earth’ company. Their mission is to work with and enable business partners and individuals wherever they are on our beautiful planet, and to make life on Earth better for all. The name ‘Hiber’ is based around the idea of hibernation and highlights the store-and-forward tech being used in Hiber’s LPGAN. The modem literally hibernates until a satellite passes over — hence, a bear being the new Hiber logo. The bear transcends different cultures, creeds and languages as they are recognized internationally. The opening of Hiber’s new R&D center in Delft, Holland, highlights the company’s position at the heart of Netherland’s new space industry. Working in collaboration with Hyperion and ISISpace, the teams at Delft will develop software and hardware for enhanced connectivity and facilitate the launch of even more satellites.